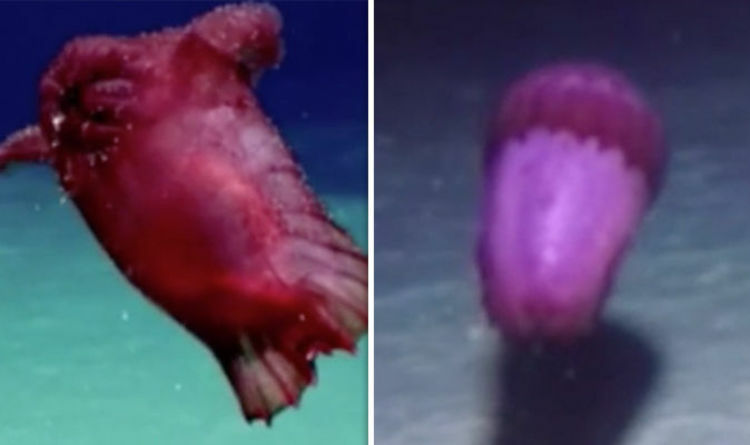 A bizarre ’headless chicken monster’ has been filmed in the Southern Ocean for the first time, at three kilometres below the sea level surface. Also known as the ‘Spanish dancer’, the monster is a scarlet-coloured sea cucumber that uses webbed wings to help it swim. Australian researchers developed camera technology to capture their first footage of the sea cucumber in the Southern Ocean. Dr Dirk Welford, Australian Antarctic Division programme leader, said: “Some of the footage we are getting back from the cameras is breathtaking, including species we have never seen in this part of the world. “The housing that protects the camera and electronics is designed to attach to tooth fish longlines in the Southern Ocean, so it needs to be extremely durable. Real name Enypniastes eximia, commonly known as the “headless chicken sea monster”, the deep-sea swimming creature is 11-25cm in length. The creature’s intestines can be seen through its body, especially when it’s soon after feeding time. The sea cucumber feeds by touching down on the seafloor, eating with its tentacles before shooting back up into the water. The footage captured by the cameras are being presented at the annual Commission for the Conservation of Antarctic Marine Living Resources meeting in Hobart today. Gillian Slocum, Australia’s Commissioner for the meeting, said: “The Southern Ocean is home to an incredible abundance and variety of marine life.